As for the quick launch toolbar to add a button "minimize all Windows"
Advice 1: As for the quick launch toolbar to add a button "minimize all Windows"
In Windows operating system the possibility of simultaneous minimizing all open programs with one button "Minimize all Windows". While minimized Windows appear on the taskbar as buttons and dialog boxes are hidden. To restore minimized Windows, click "Minimize all Windows" again. How to display a button "Minimize all Windows"
In Windows XP and Vista, the button automatically appears on the quick access toolbar on the left. To install the control panel, you right-click on an empty area of the taskbar, select the tab "Toolbar" and then "Quick launch". In Windows 7, the button "Minimize all Windows" is always displayed in the right corner of the toolbar in the form of a nondescript rectangle. In Windows 8, by default, the code folding feature of Windows disabled. To display the icon "Minimize all Windows" you need to click the right mouse button in the tray. In the appeared window "taskbar Properties" in the tab "task Bar" to mark the last menu item and save the changes by clicking on button "Apply" and "OK". "The eight" fast folding Windows displayed at the end of the taskbar. Then save the file as "show desktop" extension .scf to your desktop. Saved the file, drag it to the quick launch toolbar. Minimize all Windows is possible with keyboard or mouse even if the button "Minimize all Windows" is removed. This alternative function of folding the same for all versions of Windows operating system. So, you can use hot keys. Using a combination Win+M all Windows fold and unfold with the key combination Win +Shift+M key Combination Win+D is also used as a button "Minimize all Windows", with the first click minimizes the window, and re – expands. Another option to minimize the window press the right mouse button on the task bar. In the resulting window you need to select "Show the desktop" - so you minimize all open Windows. To return the window to its normal position, again press the right mouse button and choose in the appeared menu "Show all Windows". 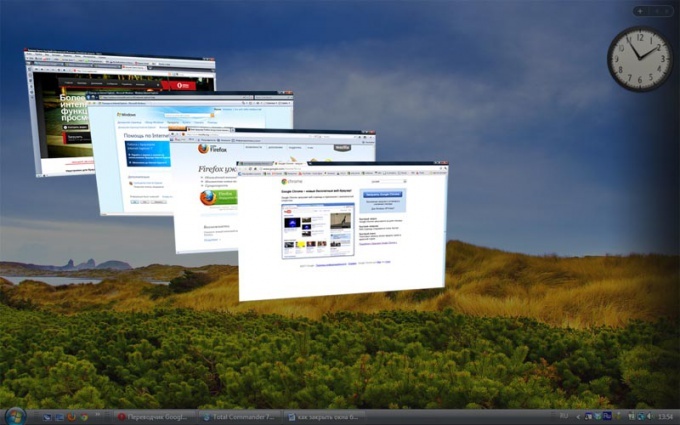 Browsing the web, users often open multiple tabs or browser Windows. This accelerates work, makes it easier. But when you install programs or application, the installer may require you to close all open browser Windows. To close all browser Windows, follow these steps. You can close all browser Windows immediately. To do this, click the mouse on the x in the upper right corner of the program. To do this with the keyboard, press Alt + F4. If you do not wish to close the browser (in order not to lose important information, for example), you can close tabs one by one. Click the left mouse button on the cross in the right corner of the tab, or use Ctrl + F4 or CTRL + W. After you close all tabs, close the browser itself. Now that all browser Windows are closed, you can install the desired application or program. In most cases, the previous steps enough. But there are times when you have closed all visible browser Windows and the program refuses to continue the installation and again requires to close the window. Log in task Manager: press CTRL + SHIFT + ESC. Another way: press CTRL + ALT + DELETE in the window that appears, select "Start task Manager". Go to the tab "Processes". This shows the processes running at the moment. Click the "Show processes from all users". Click "image Name" to sort the processes according to alfavitu and facilitate the search. Depending on your browser, locate the following file names: iexplorer.exe, opera.exe, firefox.exe, chrom.exe etc. Click on the desired process and click "End process" and confirm completion. Now all browser Windows are closed, you can install the program or application. Sometimes you need to move browser Windows without closing them. For example, you are at work and want to see the personal letters, but do not want outsiders noticed it. To quickly switch to the window of another program, for example, a Word document, use the keyboard shortcut ALT + TAB. To collapse all your browser Windows and see the desktop, press WIN + D or WIN + m to Minimize Windows by clicking on the button "Minimize all Windows" in the lower left corner of the screen, next to the "start"button. That's the whole point of this program - You will be able to close all Windows that are open at a given time on Your PC. This will help You to eliminate confusion and not to close numerous Windows separately. The program can be taken on the task bar, as shown in the figure above, clicking on the left button of the mouse, You will be able to close all open Windows. Sometimes while working on the Internet people discover a large number of Windows, assuming then return to view this information. However, they then abandon the idea, and then sometimes useful to be able to immediately close all Windows. The window appearing on the computer screen during the work, is a way of organizing information, which at the moment is dealing with the user. In this case, the window system computer interface now so widespread that the quality of the Windows documented in a variety of computer programs, Internet pages and other resources. The need to simultaneously open a large number of Windows happens due to several reasons. The most common of them is information search, which is a gradual transition from one window to another in an attempt to obtain information that most closely satisfy the search query. In the case if the user for whatever reason does not close previously viewed window, after some time on its desktop a large number of open sections. Another possible reason for this situation - simultaneous work with several arrays of information, implying a parallel appeal to each of them. In this case, the presence on the desktop several open Windows during the period of implementation of this work is to user need, saving time on the new opening of each of them at the time. when there is a need for the information contained therein. However, at some point, having viewed the Windows open, the user disappears. In such a situation there are two main options for completion of their work. The first of them - closing Windows open manually, by clicking on the symbol the "cross", which is commonly located in the upper right corner of any window. However, if the number of open Windows is a few tens, this process can be quite laborious and time-consuming. Therefore, the developers of the software used in modern computers has created the possibility of using the so-called "hot-key" combination of keys on the keyboard, depression of which causes certain actions are required. One of these combinations allows for simultaneous closing of all Windows open on the desktop computer: to do this, press the Alt key and then while holding it, press F4. This command usually causes the appearance of the menu that asks the user to confirm the intention to close all open Windows, as the developers admit that this combination can be pressed accidentally. If you are confident in your decision, you should confirm it by pressing the appropriate button, then all Windows will be closed.